Every time we get behind the wheel of our car, each of us is confronted with dealing with a number of different conditions that go well beyond our own cars and other drivers on the road. One of the these conditions is the weather, which can vary by season, by the day and in many cases, by the hour. While none of us can control the weather, we all can adapt our driving to match whatever conditions mother nature throws our way. If you live in an especially arid region, you’re probably not confronted with torrential downpours or even a little precipitation. But most of us don’t live in such areas, and thus, we’ll be forced to drive in rain and wet weather at times. Be it a spring shower, or a freak thunderstorm that dumps an inch or more of rain in the span of an hour, the vast majority of drivers will have to deal with rain and wet weather on occasion. Here are our tips on driving safely in rain or wet weather. Rain and wet roads can lead to situations where a driver can lose control of their car. Braking distances are increased, your car may skid, and hydroplaning can occur. A good driver adapts to the conditions around them, and will never allow other factors on the road to surprise them. So adjust your speed accordingly and you may not have to worry about any of those things happening. Driving carefully and slowly can prevent skids both when accelerating or braking. You should give curves special attention, braking and steering lightly. Braking too hard can cause the wheels to lock and place you into a skid situation. Even if your car is equipped with antilock brakes (ABS), you may still skid, although you will do so in a straight line. If you do begin to skid, do not panic. Take your foot off the accelerator and steer in the direction you want the car to go. You may have to turn the steering wheel repeatedly until you’re traveling in a straight line again. ABS equipped cars are safe to brake without input from the steering wheel, while non-ABS automobiles can skid completely out of control if the brakes are applied too hard. One very scary situation when driving on wet roads is having your car hydroplane. 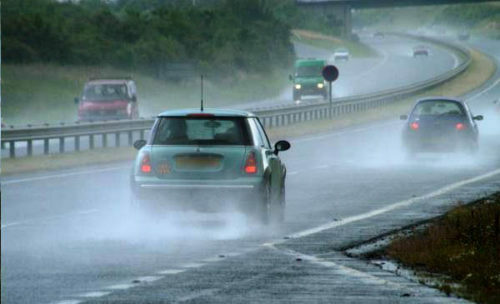 Hydroplaning occurs when water in front of your car is more than the weight of your car can push away. Your car is sliding on a thin layer of water, completely out of contact with the pavement during a hydroplane. To prevent hydroplane situations, keep your speed to a reasonable level, and never drive through puddles if you can safely avoid them. One good tactic is to drive in the tire tracks of any drivers in front of you, as doing so will enable you to prevent your car from hydroplaning. If you do experience hydroplaning, don’t suddenly break or turn. Doing so can make your car skid out of control. Ease off the gas, and your car should return to the road. If you have to brake, remember that ABS equipped cars don’t require pumping the pedal. The ABS is much more capable of pumping the brakes than any driver. Good windshield wiper blades are a must. Always ensure you have a fresh set of blades capable of removing water. A good rule of thumb is to replace your wiper blades every six months, or when they no longer sweep away water off the glass effectively. We also recommend rain repellant application to your windshield. These products cause water to bead up and roll off your car’s glass. The most popular version is sold under the Rain-X brand. Make sure your tires are not worn. Worn tires have less grip, and will be more prone to hydroplaning. Additionally, make sure to check for proper inflation on your tires at least once every 30 days, or monthly, at minimum. Properly inflated tires are less prone to hydroplaning and will last longer. They’ll also ensure you’re maximizing your fuel economy. Never use your cruise control on wet roads, as it too can lead to hydroplaning. This recommendation should even be followed if your car has advanced active cruise control. Because rain and moisture can lead to fog, make sure you adapt your driving if you drive in a foggy area. Fog greatly reduces your visibility, and calls for reducing your speed and following distances.